If you’re huge fans of ABC’s black-ish, then you may be missing the show like we are. Well you’re in luck, because Dr. Rainbow Johnson can still grace us with her presence in book form. Her real life counterpart, Dr. Rainbow Edwards-Barris, wife of black-ish creator Kenya Barris, mother of 6, anesthesiologist and now author, has written a fun book that cleverly illustrates her parenting mishaps with lessons learned and tips for survival. CEOMOM enjoyed an insightful conversation with Dr. Rainbow Edwards-Barris about what it’s like to see herself portrayed on TV as Rainbow Johnson, how she became an author and why her guide to parenting is no laughing matter. Who is Dr. Rainbow Edwards-Barris? I am a lot of things. I am foremost a mother, a wife, a daughter, a sister and a professional woman who is passionate about her family and her career. I am constantly evolving and changing, I am not one thing or one person. I am always trying to be better and do better and just be an example for the people that are close to me, and hopefully people that I meet and interact with, even on a small basis. I always hope to be something good and positive to others. How true to character is Bow Johnson to who you are as a wife and mother? That’s funny, because so many of the situations that the Johnson family is in are taken directly from our lives. The way the situations are played out are sometimes entertainment and sometimes not. I think that probably the biggest difference between the real Bow and Bow Johnson would be the real Bow has a better understanding of the family dynamic and what it means to interact within that family dynamic. The character Bow is learning more so who to be and how to be as a mother. I think the real Bow still has learning to do, but is much more comfortable as a mom. I always see the Bow character as a little more unsure of herself as a mom. I think the biggest similarities would be the actual situations. There is so much of the show that is taken directly from the life we are living. There was a recent episode where Bow made the tough decision to become a stay at home mom instead of going back to work. How close was this to your real life? After having our last baby was the first time I had not worked in the hospital. The longest time I had ever taken off from any of my kids was the traditional six weeks. That episode was a very real and personal experience for me. Kenya did talk to me about that episode beforehand. He wanted my input. That episode was so interesting because of the different writers in the room. There were so many different perspectives. This woman had worked so hard for her career. Going back to me constantly evolving and changing, there was a time in my career I thought I would never take off from work. As my life progresses and opportunities present themselves I have told myself that it is okay if I felt one way years ago or even yesterday, today I feel differently. I try not to allow myself to be painted into a box. I thought it was important that Kenya expressed in the episode that the decision came with a lot of thought. That time in my life felt right and the time in the character’s life felt right and not just random. What reservations or fears, if any, did you have of black-ish having a character based on your real life? My biggest concern was protecting my children. In the beginning of the show, as with anything especially in entertainment, it is so subjective so you don’t know how people are going to receive it. Are they going to get it? Will they appreciate it? I go into most situations with a healthy skepticism. I am always hoping and praying for the best, but I am also aware of how things work. I have always had that sense of awareness. As the show progresses people are receiving it and understanding it in different ways. At that point, I realized it wasn’t going anywhere. As a mom I don’t care what people say or think about me. I don‘t want my kids to be subjected to or exposed to anything negative or anything they are uncomfortable with. It has been interesting trying to find that balance with how I feel and how they feel and how to speak with them about things they are uncomfortable with or things they don’t want people to know. I just think it is important as human beings that everything is not always depicted as good, but as a parent you can’t help but want to protect your children. For us it is oftentimes so personal. Our girls are a little bit different, because they have a greater sense of awareness than our boys. They feel like they are being exposed or criticized. They are often more like, “did he have to do that? I didn’t do that.” You have to make it entertaining. It’s been more of a growing and learning process for them as well. Sometimes I have to think about the fact that they are growing up with this show. I have to think about what they may be feeling. What inspired you to write Keeping up with the Johnsons: Bow’s Guide to Black-ish Parenting? I had been thinking about writing a book for a long time, years actually. When I first started med school I was going to get my PhD as well. I often felt like there was something else I should be doing..something more. Years ago before we had our fifth child, I was talking to Kenya and said to him that I wanted to move forward with getting my PhD. Then I worked in a lab and realized I didn’t want my PhD, I wanted to teach and do more speaking to young people and girls and tell them about my life and the possibilities. He said, “maybe you should write a book. Just start writing ideas.” After we had that conversation, I started writing down some of my ideas. Sometimes I would write a quote or something specific the kids had said. I started writing down the things that were important to me which were my interactions with the kids. I decided to take a little bit of time off after having my last baby. This was the first time I wasn’t in training after having a baby. Over that time, I started to think about the things I wanted to do. I thought of putting a book together, because this was the first time I was not actually working in the hospital. I figured out what I wanted the focus of the book to be which was parenting and kids. We were moving and my sister was helping me clean up. She told me that she found this paper and I should see it. In 2009, I had taken out a sheet of paper in a daily planner and I had started to write about the book that I wanted to write. It was such an amazing moment for me to see my book really come to be. I feel like I am the most non-creative person. I don’t like how I write. This has made me really come out of my element, but it was the right time. I had been really wanting to write this book. In a brief synopsis, tell us what the book is about. It’s really about taking specific experiences, incidents, trips and conversations that Kenya and I have had with the kids and working through them. I show how I parent in any particular situation whether the outcome be funny or sad or thought provoking or right or wrong. When I started, I went back and literally dictated out our real life situations and changed them into actual stories. I have always believed that experience is such a great teacher. You can tell someone about something but when they do and experience it they learn more. There’s a wow factor. They think, now I get it. I hope that sharing my experiences with people will be a way to help other parents, especially moms, understand that others can relate to their challenges. They are not alone. That’s how she dealt with that. Maybe I can try that solution if that comes up. It’s not a medical book or a comedy at all. It is just a collection of ways I have interacted with my kids and how sometimes I did things wrong with them and others I did things right. Doing that may help other people learn about their own lives. You really do have to let go some of the things that don’t matter. I tell my kids that all the time. Sometimes I do put focus on things that don’t matter. I think having a career has helped me put things into perspective. Is this a big deal, does this matter? I try to convey this to my children as well. I try to let them know when I am wrong about something. I am going to work on whatever that is. Hopefully my children understand that it is okay for them to make mistakes. You did something that you knew you weren’t supposed to do. If I ask you about it tell me the truth. It’s my belief and my experience that kids are so different. I have to adjust to help them be the best person they can be according to who they are. What is the most significant cultural contribution the TV show black-ish and your book have on conversations about the modern black family? Society’s thoughts and opinions of what a modern black family, I think most of the time is far from the truth. The Johnson family, who is representing my family, shares so many of the same values and experiences as many American families whether you are black, white, Hispanic or Italian. We share so many of the same experiences being American and at the same time there is an additional experience and part of life that, to this day, is unique to black people. We are shedding some light on that to the viewers and the world. I think it has been profound and really important. As a doctor, mother of 6 and author, how do you define balance? What is your must-have to help you stay centered? For me balance is really how I am perceiving my life on any given day or moment. I have the realization that I am one person who can only do so much and there are only so many hours in a day. One day is not an equal day of any one particular thing. Today may have been I was with the baby all day, because he really needed to be with just me all day. I could have had other things I needed to get done that day and the kids come home from school and they need something. I have days where all of these things feel really overwhelming. I can have a day when I say you know that the baby needed me today and the other things will get taken care of. The other kids that needed something will have to learn that I am not able to give what they need that day but maybe next time. My balance is in my mind knowing that the physical balance of life will come as it is supposed to and I have to be okay with that. I have tried using a calendar, but it just feels like a job. It’s the big picture and my perspective and how I look at my life, knowing that it all is full circle. Today is the end of the day, but it is not the end of this particular process. The process just continues. I adjust and make sure I don’t look at anything in life as too big or too small. I know that the needs of all the kids and myself change each day and that’s okay. I have to make sure that I am comfortable with that and reassure myself. I tell myself that you need to go sit somewhere and be with yourself. My must-have changes. I think manicures and pedicures are so important. They pull it all together. If nothing else looks good, make sure your feet and hands look good. People will respect you. When I was younger I would do French manicures for my friends. It has always been important to me. 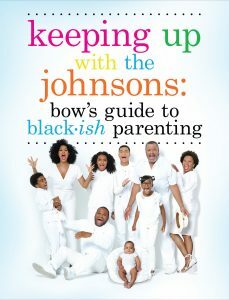 Get your copy of Keeping Up with the Johnsons: Bow’s Guide to Black-ish Parenting at https://www.amazon.com/Keeping-Up-Johnsons-Black-ish-Parenting-ebook/dp/B0793HVJ1F.